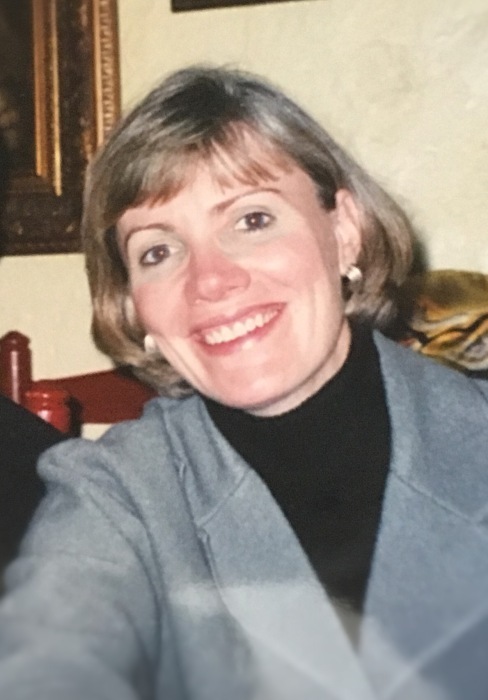 Mary Beth (McMahon) Carrier, 57, died on August 22, 2018 at the Crotched Mountain Rehabilitation Center (CMRC) in Greenfield, N.H. Mary Beth resided at CMRC after suffering a brain aneurysm rupture in 2003. Mary Beth graduated from the West Springfield, MA public schools. She received a Bachelor’s degree from Springfield College and a Master’s degree from Lesley College, Cambridge, Ma..
Mary Beth began her career as an elementary school teacher in New Orleans, La. She also worked as a sales rep for the former American Home Foods and on the bond trading desks for the firms of Bear Stearns and Smith Barney in Boston. She returned to teaching when her children began school. She was teaching at the Hatherly school in Scituate, Ma. when she fell ill in 2003. Mary Beth is survived by her loving family: her husband, Steve Carrier of Scituate, Ma. and her beloved children, Jack Carrier of New York City and Abby Carrier of Washington, D.C. She also leaves her parents, Mary Pat and Jack McMahon of West Springfield, MA. and her two sisters, Megan J. Callow of Fort Mill, S.C. and Julie E. Borge and her husband Richard of Newtown, P.A. Mary Beth was predeceased by her brother, Matthew in 1991. “Aunt Mimi” leaves her nieces and nephews, Benjamin McCormick and his wife Caroline and their son, James of Cohasset, MA., Katherine Callow of Boston, MA., Rachel Callow of Charlotte, NC., Charlotte Borge and Elliot Borge of Newtown, PA. She leaves in New Hampshire, her father-in-law, Richard Carrier of Laconia and her sister-in-law and brother-in-law, Sandra and Steve Taylor and their children, Peter and Lauren of Exeter. Mary Beth also leaves many aunts, uncles, cousins and dear friends. Mary Beth’s family express to her caregivers, therapists and friends at CMRC their love and gratitude for their superb and loving care. Her life was full of compassion, dignity and love. They are the angels who walk among us. Family and friends are invited to celebrate Mary Beth during visiting hours on Wednesday, August 29, 2018 from 4-7 pm in St. Anthony Church, 10 Summer St., Cohasset, MA. A Mass of Christian Burial will be celebrated on Thursday, August 30, 2018 at 11 am in St. Anthony Church, Cohasset. Interment private. In lieu of flowers, donations to honor Mary Beth may be made to the Hospice at HCS, PO Box 564, Keene, NH 03431.